January 5th, 2011... 7:40am. 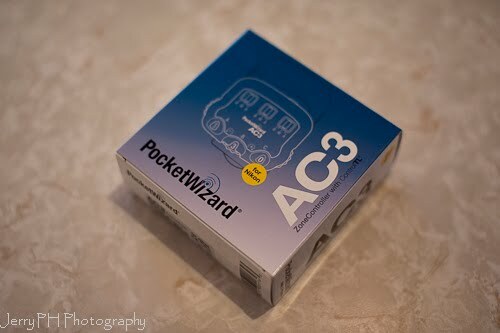 I receive an email from Jim Clark asking me if I would be interested in being part of the beta team for the coming PocketWizard product called the AC3 Zone Controller for Nikon cameras. Of course I knew what the AC3 was (and to be honest, I knew who Jim Clark V.P. 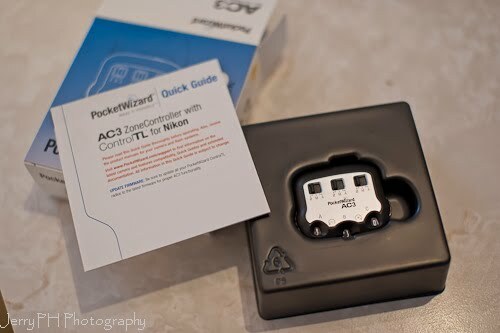 of LPA Designs was... as would anyone that knows who created the PocketWizard line of products), and since I was amongst the slew of many who had recently ordered and received their new FlexTT5 for Nikon product, I was like "heck yeah, I'd love to!". Mr. Clark then took steps to make arrangements for me to receive one of the beta AC3 units and make me a part of the team. He was also generous enough to send me an extra FlexTT5 unit (since I had only 2 units of my own at the time), for reasons I shall later explain. Suffice to say that the man is a gentleman! Edit: Updated info as of January 12, 2011 - I am now a beta tester for LPA Designs and wish to thank them for the opportunity of being able to be a small part of the process that helps them. I have signed a NDA but will continue to share things that I am permitted to. For the AC3, since it has been available for the Canon users for a while now, nothing here that I write is counter to our mutual agreement, and I have been granted a good amount of leeway to discuss functionality. Of course, I know nothing of release dates, future projects or features, nor am I the person to contact in the event you are having support issues... I am just a guy that was given the opportunity to test a few of their products... and through that, have a heck of a lot of fun! For those that do not know, the AC3 is something very simple, yet profound. It does one thing... it gives you total control over your off camera flashes all from the top of your camera. 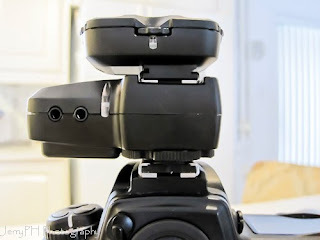 Your lights can be at the other side of the room 13 feet in the air and if you needed to change the power output, you just flip a switch or rotate a small dial that sits on the controller that is slid into the hot shoe connector of your FlexTT5 or MiniTT1 that is sitting on top of your camera. Now, I said it does something simple, but that does not mean that the unit cannot aid in helping you accomplish some pretty impressive and complex tasks! Before we get into the intricacies of this product, let's take a look at it. What does an AC3 Zone Controller look like? The unit is nicely boxed in typical PW manner, meaning tight, attractive and well designed. My first impression was of how small it was in real life. It was a touch smaller than I had envisioned it to be, as I had seen the Canon equivalent versions of this device online. The ergonomics, though, are excellent and I can see people of any sized fingers being able to easily control all the dials and switches without difficulty, and within a very short time, without even looking, which is something that I as a wedding photographer, value very highly. It clicked in with a satisfying firmness into the locking pin hole and sits nicely on top of my FlexTT5. 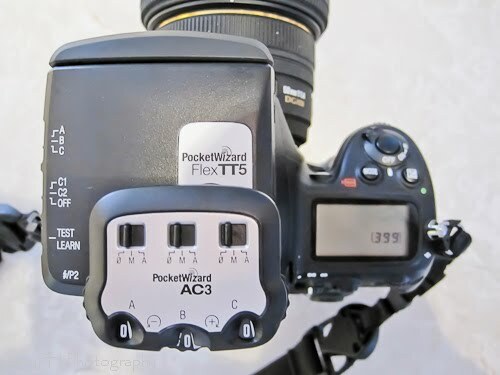 For myself, I have decided to use all FlexTT5 units in my setup, since every FlexTT5 is a transceiver and I did not want to get into the minor hassle of needing to carry anything else other than rechargeable AA batteries with me. The MiniTT1 uses a 3 volt Lithium battery (CR2450), or a Lithium coin cell battery (CR2354). All FlexTT5 units use simple rechargeable AA batteries, which is just how I like it. 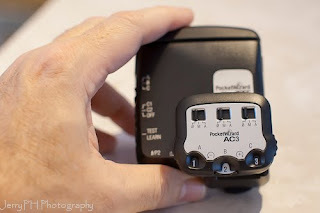 On camera, the FlexTT5/AC3 combo has no wobble and is very stable, and the AC3 is as light as a feather (it requires no battery, and takes it's power, I *believe* from the unit underneath it . I would have to guess it cannot draw a lot anyways, with the biggest drain coming only from the AC3's status LED, from what little electrical knowledge that I possess). The combined weight of the FlexTT5 and AC3 is minor, and one of the main reasons I prefer this setup over the Radio Poppers (that force you to carry the weight of a full flash and their transmitter on top of your camera. Sorry, but my D700 with battery grip and a nice 70-200mm lens are already heavy enough, no need for even more weight if I do not have to!). Another reason I do not like on camera flash (besides the flat lighting), is that many Nikon D700 users that place the SB-900 on camera regularly, over time develop an issue where the camera's hot shoe becomes loose or damaged, causing random flash firings and possible camera/flash damage. Repair is done by Nikon on your dime. This is NOT an issue with the FlexTT5/AC3 thanks to their lighter weight and no need for an on camera flash! So, how does it work and exactly what can an AC3 Zone Controller do? In "0" mode, the dials have no function, as every flash that is in the zone with this setting is disabled. In "A" or automatic/TTL mode the dial adjusts the power in 1/3rd stop increments anywhere from -3 stops to + 3 stops over or under whatever TTL setting the camera says you need. Think of this as a sort of exposure compensation mode. In "M" or manual mode one can use the dial to adjust power from full power, or 1/1, if you will, to 1/64th for that zone. 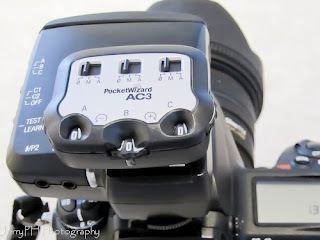 The black background 3 (or -3), sets the flash power to 1/64th,. The +3 (or white background), sets it to 1/1 or full power and again, you can go anywhere in between in 1/3rd of a stop increments. Quite impressive! Because this is likely where I will be 95% of the time, a fast way for me to remember where I am on the scale is that a setting of 0 on the rotary dials is 1/8th power. 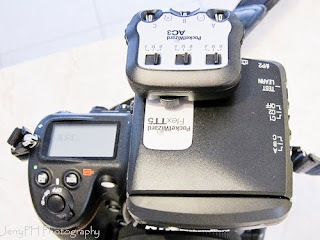 A short while of using this and you will be able to look at the numbers and know immediately what the power output of your flash is set to without thinking about it. How do you control what flash belongs in what zone? 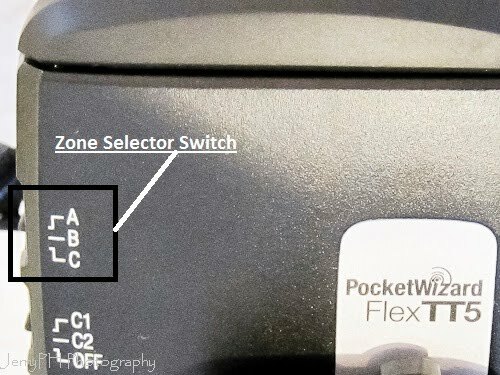 On the remote FlexTT5 that you place a flash on, you have a switch that selects what group it is a member of, either A, B or C. You are then able to control all flashes that are a member of a particular group from the AC3. You are not limited to 1 flash per group, you can have as many flashes in a group as you wish, and all will respond to the commands of the AC3. If your name just happens to be Joe McNally and you have 50 SB-900s and 50 FlexTT5's at your disposal, you could place 10 in zone-A, 15 in zone-B and 25 in zone-C or any combination you could dream up, and control each zone with perfect precision! Here is a nice little touch... the three zones do not need to all be set identically! This means that one can mix and match any of the 3 modes on any zone in any way, so if I wanted to, I can have zone-A set to "M" or manual control, zone-B to "A" or TTL mode and zone-C turned off or (again), any combination thereof. Another feature to be aware of is the results of using the Test/Learn button on your MiniTT1/FlexTT5. Pressing it will only fire the flashes that your AC3 settings permit. If you have all 3 groups turned off, no flash will fire. when the test button is pressed (which is logical). Placing a group in M or A mode will fire off all flashes in that group. Also, if your AC3 group is set to manual, pressing the Test/Learn button fires off the remote flash at the power setting that your AC3 is telling it to fire at. As a general rule, you don't want to be firing off test flashes at full power, so be aware of this. 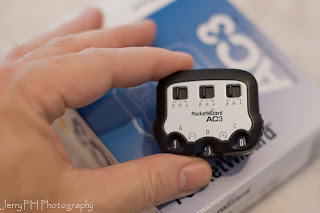 The AC3 is amazingly flexible in terms of possibilities. Ok, enough marketing... does the AC3 work? YES! It is an amazing tool that I think every ControlTL user should have. However, I am currently testing the AC3 for the Nikon and have not done all the tests I would like to do. This is why I am honored to be on the beta team, to push this little unit and report back my results both to you and directly to the creators of this marvelous accessory. I have a small battery of tests that I plan to do, and the results will be reported. The basics as done via all FlexTT5 units (no MiniTT1 units here), one on camera with the AC3 in place, and 1 or more units for off camera use. - Units set to factory standard C1 and C2 configurations unless so indicated. Test 1a - FlexTT5 / AC3 on camera, One FlexTT5 with a bare SB-900 as the remote flash. Goal is to test the basic 0-M-A functionality. Test location was my living-room indoors. The "0" setting effectively disables the flash in whatever zone you wish. It is effective in turning on or off the flashes in all 3 zones in all possible combinations, until another setting is chosen (either M or A). Let's give this a PASS. The "M" setting places all flashes in this zone to a fixed manual setting. The black 3 (or -3) equals the 1/64th setting, and all settings up to and including +3 or full power are functional. I have not taken a light meter and measured the accuracy of the 1/3rd steps up or down, however, the 1 step drops or raises of the same subject seem very accurate according to the camera histogram. Let's give this a PASS. The "A" setting places all flashes in this zone to an iTTL setting. Self adjustment of the same subject at different apertures does give me very similar histograms as long as ambient light is not contributing, to be able to give accurate test results. Let's give this a PASS. Test 1b - FlexTT5 / AC3 on camera, One FlexTT5 with a bare SB-800 as the remote flash. Let's give this a PASS. Test 1c - FlexTT5 / AC3 on camera, One FlexTT5 with a bare SB-600 as the remote flash. Let's give this a PASS. All tests were repeated 3 times in each of the possible flash zones (A-B-C). Test results were identical in each zone (no deviations or changes of performance were noted). Goal: Ability of the AC3 and FlexTT5 to match speed performance of the Nikon CLS system. In CH setting the FPS audibly dropped to about 4 fps due to time needed for TTL to meter in between shots, but all frames exposed properly. Important note #1: maximum fps of camera is not exploited when using EN-EL3e battery as opposed to the EN-EL4a, however, when the EN-EL4a battery is used, maximum FPS rises to 8 fps. The change in Aperture Priority mode then drops from 8fps to around 6-7 fps. This is normal due to the time needed for the TTL to verify exposure in between frames. Important note #2: To regain maximum speed of 8fps in Aperture Priority Mode, you can lock in the exposure using the FV LOCK option and maximum FPS speeds are regained. Repeating the same test, but using a FlexTT5 on camera with AC3 in place, and the remote flashes were two SB-900s, one set to group-A, second SB-900 set to group-B for the initial setup. I manually set the AC3 to "M" mode for all groups and flash power set to a (-2) value, that equates to the same 1/32nd power as in the CLS tests and fired off a test shot. The single frame exposed identically to all the above frames under the Nikon baseline tests. AC3 mode changed from "M" to "A" in all 3 groups. In CH setting the FPS audibly dropped to about 4 fps due to time needed for TTL to meter in between shots.but all frames exposed properly. Important note #1: maximum FPS of camera is not exploited due to using EN-EL3e battery as opposed to the EN-EL4a, however, when EN-EL4a battery is used, maximum FPS rises to 8 fps. The drop in Aperture Priority mode then drops from 8fps to around 6. This is normal due to the time needed for the TTL to verify exposure in between frames. In all continuous shooting modes of Low and High, a minimum of 20 frames per test were used each time. 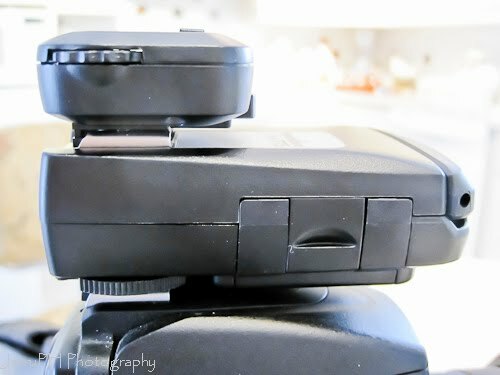 This test was a complete success where the AC3 /Flex setup matched all the performance results of the Nikon CLS setup. I then repeated the above tests using group B and then group C separately on the AC3. The next variation of tests was done with 2 sets of speedlights in groups A-B, then A-C and B-C. I then repeated the entire series of tests with a pair of SB-600s in place of the SB-900s and the tests were identical in terms of positive results. Chalk-up another PASS for the Flex/Flex/AC3 combo on my D700, along with 2 SB-900 and 2 SB-600 flashes used in this test. Goal: Answer the question of if CLS and ControlTL can be used at the same time. I should have known the answer to this test before doing it, but I went through the motions of using 2 SB-900s for the remote flashes. One SB-900 was configured to be a CLS client, on group A, channel 1. The second SB-900 was set to pure TTL mode and the Flex was set to a factory default Configuration 1 and channel B. The answer is... no you cannot use both CLS and ControlTL at the same time. The reason why not, I believe, is a simple one... ControlTL technology squelches preflashes (which the speedlight set to be the remote CLS client needs to know what settings to use and when to trigger), the trade offs are faster recycle times, more pops per battery charge, less blinkers thanks to the missing pre-flashes. Goal: A little real world testing. There was to be a strobist meeting today that was unfortunately canceled, so my friend Kris generously let me invade his photo session he had set up to give me a few minutes to play. This was close to the way I would do a real session, however without any pressure for me to deliver, I just set up the equipment in a small room and fired off a few test shots here and there. At that point, the stability and functionality of the setup returned and I proceeded to quickly test the AC3 functionality in both M and A modes successfully. I will admit that I had a blond moment where I reversed the settings between groups A and B, and then was scratching my head wondering what was up. One of the things that I think is very important, is to practice with your units several times before actually using them in situations where results are critical. The fluidity of the setup, one's mindset and workflow changes a lot if you are used to using just CLS or an all manual setup. Get real comfy using the Flex/AC3 combo before going out there on a paid shoot... it could be a very frustrating moment to be in a time sensitive situation and needing to reset all the units. Goal: Mixed environment, studio heads/Plus II and speedlights/FlexTT5... does it work? Today's little test was to see if one could mix/match studio heads with Plus II triggers and speedlights with the FlexTT5 triggers and have it work together harmoniously. The fast answer is yes, if you have a Flex or Mini in the hot shoe of your camera. As I mentioned before, the Flex/Mini transmits on both standard and ControlTL channels at the same time and these channels are completely configurable in the PW Configuration Utility software. On top of that, I was able to easily exploit 1/320th shutter speeds on both the studio heads with the Plus II units as well as the Nikon speedlights (in this case, a pair of SB-900s), all thanks to perfect factory settings of Hypersync. 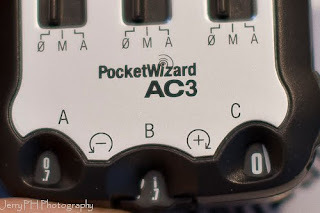 Obviously the studio head's power settings had to be set manually at the flash head, but the Nikon units were easily configurable from the AC3 zone controller. It was a very interesting test to mix and match manual studio heads to TTL settings. 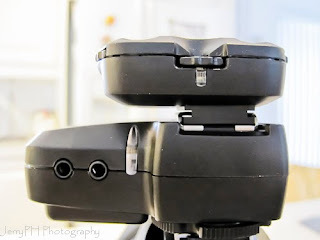 While I would mostly use manual settings normally for all my lights, it can be a time saver to set the studio head for the rim light or an overhead circle on the ground of the subjects and the speedlights adjust themselves automatically via the "A" mode setting. If any adjustments were needed, they could easily be done on the AC3 controller, of course. One thing that I noted, was that in factory default setup, the ControlTL clients seamlessly moved from Hypersync speeds to HS FP speeds at which point the Plus II controlled units just stopped working. In a perfect world, perhaps we could just move into the Nikon High Speed Hack and I would be able to use the Flex/Plus II combo and move all the way up to 1/8000th of a second shutter speeds like when using 2 Plus II units on my studio head. Maybe in a future firmware release? Only time will tell. Chalk up another PASS for the FlexTT5! Goal: SU-800 issue, does it exist with the AC3? With a Flextt5 as transmitter and an SU800 as controller. it was found that if you have everything powered up an running and then push the test button on the Flex, the SU-800 becomes unresponsive. If you turn off the SU-800 and then turn it on again, then everything works fine again. These conditions are repeatable and all FlexTT5 units have the most recent firmware (v.2.100). I was asked if the same thing happens with my beta AC3 unit. Nikon D700, FlexTT5 and AC3 unit on camera, FlexTT5 and SB-800 and SB-900 as remote flashes. Turned on a SB-900 ( set to group A), SB-800(set to group B), all controlled with Flex units. On camera Flex and AC3. AC3 controls set groups to "M" or manual and power set to 1/8th. Then did the exact same test again all over but the AC3 was set to Auto modes for groups A and B. At no point did I experience any issues or lack of responsiveness. Addendum: I quickly tried the test with a MiniTT1 as well doing the complete series of tests and the results were identical, meaning, no loss of responsiveness, everything worked as it should. End of tests done at this time. Have a test that you would want me to try using the AC3, 3 FlexTT5, SB600/800/900? Shoot me an email to info "at" jerryph "dot" com and I'll see what I can do!